This time, we delved into the exquisite food of the Mediterranean and chose the chickpea salads as our favorites. These delicious salads can be enjoyed as a side dish in your meals or, better yet, as a main course, for example, for the night. 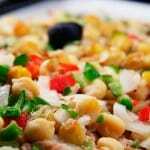 The chickpea, its main ingredient, is extraordinary for people who are diabetic or with insulin resistance , since it is one of those slow-absorbing foods that provide energy without drastically increasing insulin levels in the body. Like lentil, this legume is rich in fiber and has carbohydrates and proteins, which is ideal for vegetarians ; then combine it with a cereal and you have a protein meal with unsaturated fats. Not to mention that most of the rest of the ingredients of all these salads, are full of vitamins, fiber, water and low calories . This is one of the simplest ways to prepare chickpeas. You'll have them ready in less than 10 minutes. 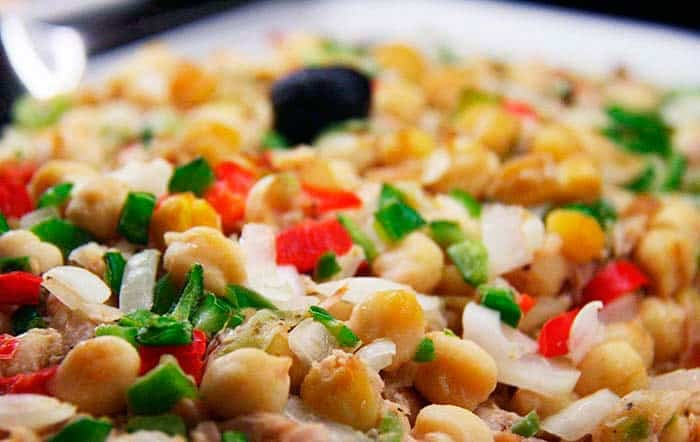 Delicious and easy salad of canned chickpeas, quick to make and very nutritious.We have more options for you to prepare. There are many ways to prepare homemade chickpea salad. This legume does well practically any protein and dressings. Here is a list of recipes for you to prepare. It is rich, it is easy, it is prepared with pure "canned" and does not require any knowledge of kitchen to make it. It is the perfect salad for anyone who does not know how to cook. The magic touch is to put olives! The recipe is here. Absolutely delicious, healthy and vegetarian, in fact, VEGANA. It is prepared with chickpeas, green beans, carrots, peppers, capers and various dressings. Learn how to make this vegan chickpea salad. Click here to see the preparation. Ideal for when temperatures start to rise. This delicious salad recipe is prepared with tomato, boiled egg, red onion and various condiments. Try it! Look at the recipe here. Chicken and chickpeas are good friends. This recipe confirms it. In addition to the 2 main ingredients, it also has: gherkin, chives, cherry tomatoes, stuffed olives and the respective dressings. Here you can read the recipe. I think that of all the recipes for chickpea salads that exist in the world, this is the best one of all. It is prepared with eggs, desalted cod, red peppers, parsley, lemon, olive oil, salt and pepper. Read it here. I think all the salad on this list are healthy and easy. But this one stands out. Includes turkey breast, corn, cherry tomatoes and olive oil. You're going to love it. Click here to read it. A Mexican salad! Possibly it becomes your favorite and if you do not believe me, wait until you try it. It is prepared with avocados, tomatoes, red onion, cilantro, lemon and ... (optional) hot pepper. Look at the recipe here. This is one of my favorites. Like all other recipes, it is prepared in a few minutes and has very few ingredients. Also, it's super food! Recipe for chickpea and spinach salad. This recipe is magnificent. Carry prawns! Everything that is done with this sea fruit is wonderful. It is prepared in a few minutes and it is a complete meal, high in proteins that you will love. Here you can see the recipe. Did you like them? You can unleash your creativity and alter any of these recipes to your liking and create your own. And remember to share on social networks!